Nothing beats a relaxing bath and pamper evening so I was extremely excited when these arrived at my house! 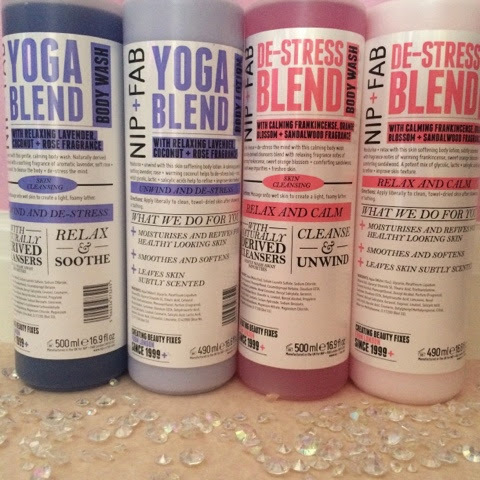 I have two of their ranges to try: Yoga blend and De-stress blend. I decided to use one variety for 2 weeks and then switch to the other for a further 2 weeks to see what the difference was. The yoga blend has a lovely lavender, coconut and rose fragrance. This is a very relaxing scent and left me smelling very fresh. The de-stress blend has a very calming and relaxing scent, when using the body wash it really helped me to unwind. It is made with frankincense, orange blossom and sandlewood. Apart from the scent, both ranges worked in the same way. The body washes were rich, lathered extremely well and left me feeling soft. Using these combined with the body lotions literally left my skin feeling amazing. The lotions left my skin feeling soft and supple, I preferred the de stress blend but only due to the scent.